You’re here because you want to learn how to get picky eaters to try new foods. Perhaps you have one picky eater or two at home and have found yourself making multiple meals –I get you! 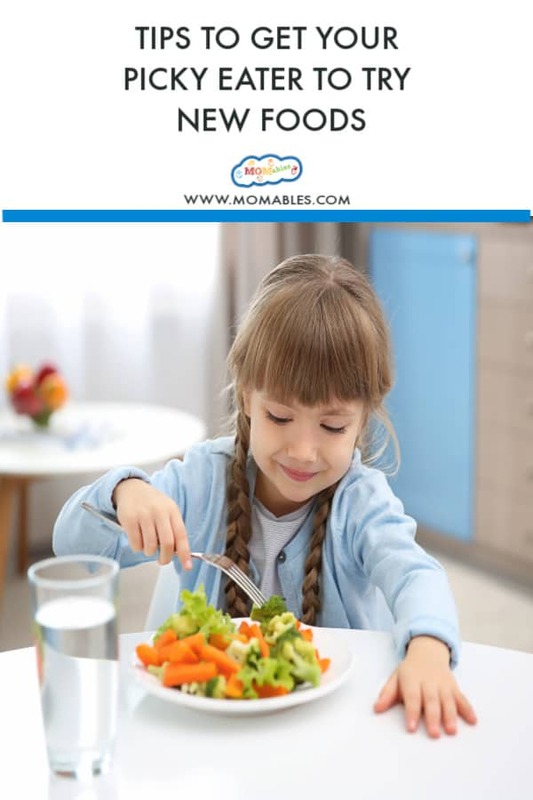 There are thousands of parents in the MOMables community with kids that are hesitant to try new foods. 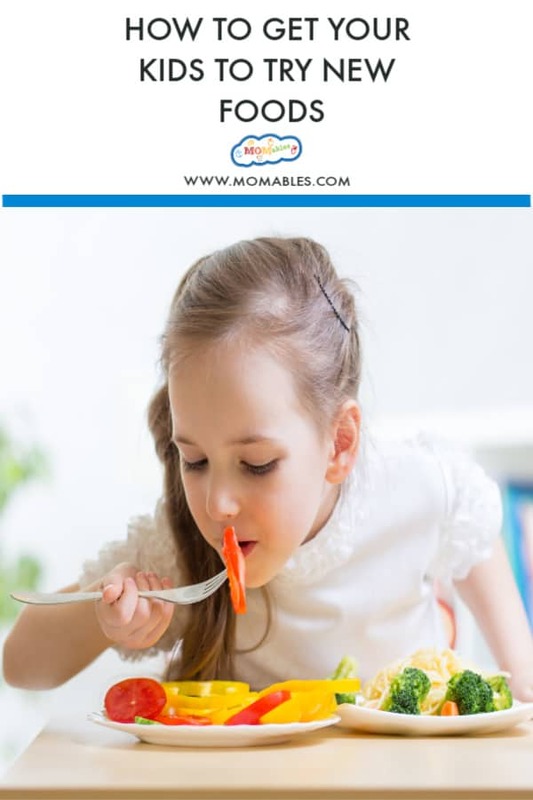 It is normal for kids not to be as adventurous as adults when it comes to trying new foods; however, many kids just refuse to try anything new, and this can be very frustrating for any parent. It’s easy for kids to get overwhelmed with a lot of something new on their plate. When you plate food for your child, start with a very, very, small portion. Most parents serve portions that are too large and this can easily overwhelm a child. The easiest thing for the child to do is avoid trying the new food altogether. Instead, give the child the option of whether they wish to try what’s made for dinner. It’s their choice to eat it or not; and if they only each chicken and rice for dinner and not the broccoli, it’s ok. There is always next time. Offer but don’t push. This is a big one and a difficult thing for many parents to adopt. Nearly all picky eaters are grazers and most are constantly asking for snacks. It’s easy to think that our kids are eating a small portion of food during snack time and that it surely can’t have much effect on mealtime. As it turns out, most kids are not hungry at meal times and without hunger, there’s little desire to embark on the adventure of trying something new. Create a 3-day food journal of all the foods your kids eat and drink. You’ll notice that they are often grazing throughout the day and that they are eating enough food to keep them from feeling hungry, thus making them less hungry at mealtime. Creating a mealtime schedule is vital to avoid grazing and snacking too close to mealtime. Assess a good time to cut back on snacking about 2 hours before meals. This will allow enough time for an appetite to develop. Many kids refuse to try foods because they are afraid of disappointing us when they truly don’t’ like something. Or worse, parents have built up so much pressure to trying something by “taking a bite” that a child literally gets stage fright from the pressure. Pressuring our kids to eat or try new things is not a long-term solution. Instead, it causes the child to feel angst towards unfamiliar foods. Creating a no-pressure environment is key for long-term success. Many households have the “one bite rule” or a “no thank you” rule or another similar tactic when it comes to trying new foods. While these rules are successful for some families, they simply do not work for most parents of picky eaters. The reason is that these rules put pressure on a child to eat, and this proves the opposite; it reinforces their position of refusal to try something new. Eliminate pressure at meal times. This is our #1 rule for parents –yes, for parents- when it comes to helping them teach their picky eaters to try new things. Parents can influence what a child tries merely by their selection of the foods made and how parents approach food, but no one can make a bigger difference than the child’s friends. Sometimes, all it takes is for a friend to come over for dinner and your child to watch them enjoy the same meal they too are being served. 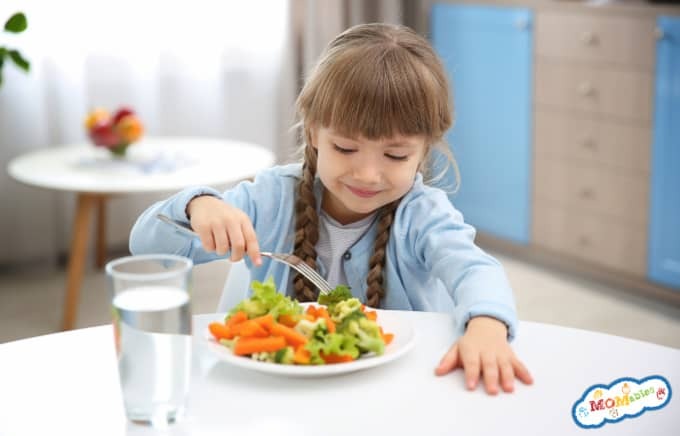 While your child might not like the broccoli, they will get over the hump of trying it just by watching friends eat. 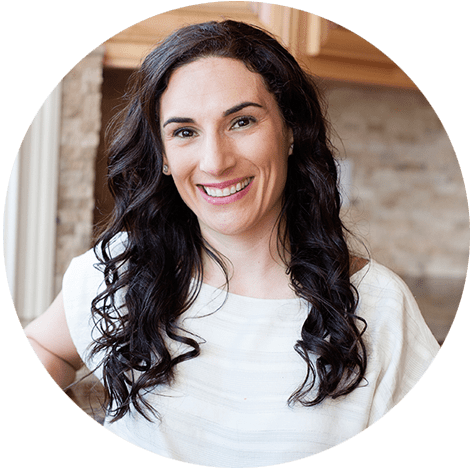 I’d love to share with you how I got my picky eaters to overcome the fear of trying new foods. If this is of interest to you and really need the help to make mealtimes less stressful, click here. I’ll also send you 10 of our member favorite side dishes for you to try. 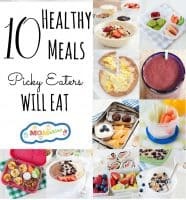 GRAB THE 10 RECIPES PICKY EATERS WILL LOVE EBOOK. How to get your picky eater to try new colored foods. Plus picky eater strategies and tools to make the kitchen a happier place.